Hady (Arabic: هدي), also known as Damm al-Shukr (Arabic:دم الشكر), is an animal sacrifice carried out by pilgrims on the 10th of Dhul Hijjah. It is Wajib for those performing Hajj al-Tamattu and Hajj al-Qiran and Sunnah for those performing Hajj al-Ifrad. It is a means of expressing gratitude for having been granted the ability to undertake Hajj and Umrah in the same journey. 3 When is Hady Performed? 4 Where is Hady Performed? Hady is carried out in remembrance of the prophet Ibrahim’s S willingness to sacrifice his son Ismail S (other narrations mention it was Ishaq S) at Allah’s command. As he was preparing sacrifice his son, a sacrificial animal was provided as a substitute at the last moment. …he then went to the place of sacrifice and sacrificed 63 (camels) with his own hand. Then he gave the remaining number to Ali I who sacrificed them and he shared his sacrifice with him. He then commanded that a piece of flesh from each sacrificial animal should be put in a pot. When it was cooked, both of them (the Prophet and Ali I) took some meat out of it and drank its soup. Camel 5 years or older. Cow / Bull / Buffalo / Ox 2 years or older. Goat / Ram 1 year or older. Sheep 6 months or 1 year according to other opinions. Injured e.g. its horns or teeth are broken. You can either sacrifice a sheep or goat, or alternatively, you can join up with six other pilgrims (making seven in total) and each buy a share in a camel or a cow. Hady may be carried out after performing Rami of Jamarah al-Aqaba on the 10th of Dhul Hijjah up until sunset on the 12th. It must be performed before the hair is cut. If it is carried out before or after this timeframe, a penalty will be due. If you have arranged for the Hady to be carried out but are unsure of the exact time it will be carried out, you should perform Rami of Jamarah al-Aqaba as early as possible and cut your hair as late as possible (just before sunset on the 12th of Dhul Hijjah) to ensure the sacrifice takes place within the correct timeframe. Pilgrims performing Hajj al-Ifrad may carry out the Hady after cutting the hair if they choose to partake in the sacrifice. It does not have to be performed immediately after Rami. However, the time period in which to complete the sacrifice is the same as the other two types of Hajj. It must not be performed in your home country. Through your travel agent. Most Hajj package prices cover the fee for Hady. Ensure you query this with your travel agent if you’re uncertain whether it is included in your package or not. Purchase coupons from al-Rajhi Bank, an Islamic bank which arranges the slaughtering of animals and distributes the meat to the poor. It is located in Makkah Hilton Towers. Purchase coupons from kiosks in Makkah or Mina. 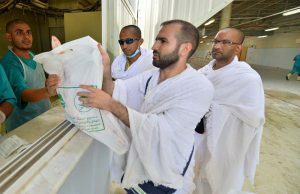 There are a number of modern slaughterhouses in Mina and Muzdalifah. It is a Sunnah to perform your sacrifice in Mina, although it is completely acceptable for it to take place in Muzdalifah and Makkah. 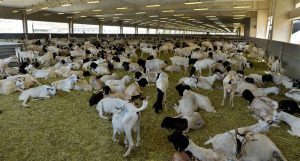 After you have performed Rami, if you have returned to your camp in Mina, you can go directly to the slaughterhouses where the sacrifices are performed. There are kiosks outside the slaughterhouses selling coupons which may be purchased if prior arrangements haven’t already been made. You can either have someone carry out the sacrifice in front of you or you may perform the sacrifice yourself. Remember that millions of animals are being slaughtered in this area, so it certainly isn’t for the faint-hearted. If you have ventured to a slaughterhouse in Muzdalifah, return to your camp in Mina after the sacrifice to have your hair cut, where it is a Sunnah to do so. If you are not going to witness or perform the sacrifice yourself, make sure someone reliable is present to ensure the sacrifice is carried out. If you’re planning the carry out the Hady yourself, ensure you inform your tour operator in advance so additional money won’t have to be paid to have someone else perform the sacrifice on your behalf. Inni wajjahtu wajhiya lillazi fataras samawati wal arda haneefaw wama ana minal mushrikeen. Inna salati wanusuki wa mahyaya wa mamati lillahi rabbil alameen. La shareekalah wa bizalika umirtu wa ana awwalul muslimeen. Indeed, I have turned my face toward He who created the heavens and the earth, inclining toward truth, and I am not of those who associate others with Allah [6:79]. Indeed, my prayer, my rites of sacrifice, my living and my dying are for Allah, Lord of the worlds. No partner has He [6:162]. And this I have been commanded, and I am the first [among you] of the Muslims [6:163]. In the name of Allah, Allah is the greatest. Bismillah, Allahumma Taqabbal min Muhammadin wa Al-i-Muhammadin, wa min Ummati Muhammadin. In the name of Allah, “O Allah, accept [this sacrifice] on behalf of Muhammad ﷺ and the family of Muhammad ﷺ and the Ummah of Muhammad ﷺ”. Following the sacrifice, you can eat from it yourself and distribute it in any way you wish, regardless of whether the one you feed is rich or poor. It is Mustahabb that you eat one-third, give one-third in Sadaqah (charity), and give the remaining one-third to family and neighbours. But if he cannot afford it, he should fast three days during Hajj and seven days after you return (home), making ten days in all. It is recommended to fast for three days prior to the 8th of Dhul Hijjah, as the Prophet ﷺ indicated that the days beyond this point i.e. the days of Tashreeq are for eating. However, if you can’t manage this, it’s permissible to fast on these days. You must also ensure you remember to fast for seven days when you arrive home.